Published Works. I am currently working on my first novel, “The Jester’s Mask” which I hope will join Nocturnal Wanderings in late 2014. Nocturnal Wanderings is the first collection of poetry I’ve written. The poems are story driven and inspired by romantic, supernatural, and gothic themes. Allusions to famous literary characters also riddle its pages. 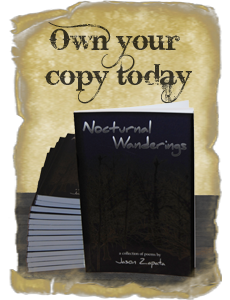 Nocturnal Wanderings is a unique experience and appealing to readers outside of the poetry scene.